Check out more photos of the Piedras Blancas Light Station. More than 100 people line up alongside the normally vacant white walls of the old Piedras Blancas Hotel on Saturday, Feb. 13. It’s 9:45 a.m., foggy, windy, and the cracked concrete of the parking lot is full of cars, also in line. Everybody is waiting to tour the Piedras Blancas Light Station, which just turned 141. Docents will be in period dress from the late 1800s, talking about what life is like on the edge of the world tending to a light meant to save ships from California’s rocky shore. SOMETHING’S MISSING: The foghorn signal building fronts the lighthouse, now missing the Fresnel lens that once reflected light 19 miles out over the Pacific Ocean. It was removed after a 1949 earthquake caused serious damage to the lighthouse, and is now on display next to the Veterans Memorial Building on Main Street in Cambria. These tours are the only way to see the lighthouse, which is now managed by the Bureau of Land Management. Year round, on Tuesday, Thursday, and Saturday mornings at 9:45 a.m., the curious meet at the hotel, and volunteers from the Piedras Blancas Light Station Association take a caravan of cars south on Highway 1, through the chain link gate, and down a dirt road toward the coast. It costs $10 for adults and $5 for children, and all the money goes into the association’s site restoration efforts. I made up group four with about 10 other folks, and one by one we pulled into unmarked parking spots overlooked by what remains of the original 100-foot-tall lighthouse. Volunteer Henry Thorpe waits for us to gather around him, and he takes us up to a lookout point just below the cylindrical reason we’re all here. To the north, teal-colored waves pour out of the ocean. To the west, the white and red brick of what once housed the clickity clackity of diesel motors generating the low moan of foghorns ducks in and out of the fog. To the south, you can hear the cacophony of elephant seals, but can’t see them. Thorpe talks history and takes us on what amounts to a two-hour walking tour of the grounds. We peruse buildings that still need to be restored, use binoculars to look for wildlife (the property is a wildlife sanctuary), watch the waves crash over rocks, and murmur in wonder at the way things once were. 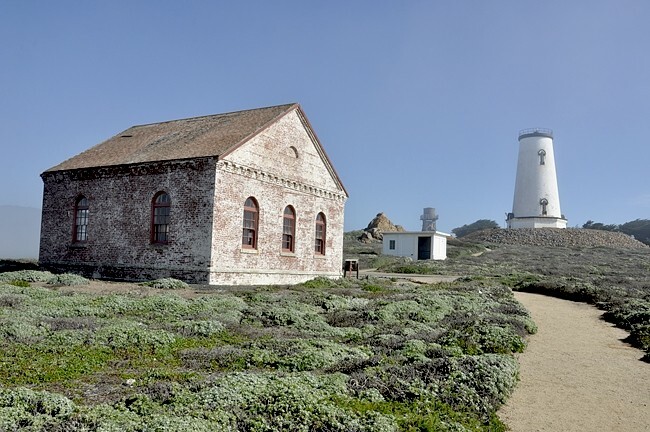 TAKE A TOUR: Volunteers from the Piedras Blancas Light Station Association lead tours of the grounds on Tuesday, Thursday, and Saturday mornings year round ($10 for adults, $5 for children) For more information, visit piedrasblancas.org. He tells us about the time lighthouse tenders attempted to bring a source of clean water to the property by building what they called a watershed—essentially an open-topped basin meant to collect rainwater falling from the sky. The tenders nicknamed the result “poop soup” because of the amount of bird poop that accumulated in the basin. Clean water, it was not. Thorpe points toward the ocean saying there are two rocks about 40 yards off shore currently engulfed in the fog. During the annual whale migration north, moms and their babies swim in between the shore and those rocks to avoid predators (yes, great white sharks). Heading into the lighthouse, he tells us about plans to restore its top 20 to 30 feet, which were removed after an earthquake in 1948. The brick walls that slope up toward its currently flat top will most likely need to be reinforced, because of how heavy the top of the light station—containing the light—will be. A stack of cages sits 40 to 50 yards from the lighthouse entrance. Inside, stuffed animals play the part of bunny rabbits. A docent runs clothes through a hand-cranked washing bin and hangs them on a line. Another docent fakes like he’s whitewashing the walls of what was once a duplex where three families lived. The wind picks up as the sun warms its way through the fog for a moment before going back into hiding. We walk back to our cars looking at the gigantic white rock filled with pelicans, gulls, and cormorants. The ocean’s too tumultuous to catch a glimpse of anything else. But maybe next time I’ll get to see a whale and her baby. Editor Camillia Lanham dreams of windblown corners of the world where solitude reigns at clanham@newtimesslo.com.